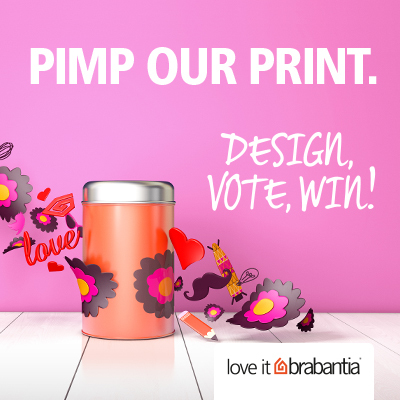 Following the success of last year’s Design Your Bin challenge, leading housewares brand Brabantia is launching a new competition for designers to create a successor to its iconic Patrice design. The ‘Pimp Our Print’ competition launched yesterday, on 03 September 2013 and will be open to all budding designers across the globe regardless of age, experience or location. The popular Patrice design, created by Patrice van Uden, was launched by Brabantia in 1970. It is distinctive for its brown and cyclam flowers overlaid upon an orange background. The ‘flower’ element was first cut out of paper and then drafted, before being screen printed in two colours, lending the pattern a ‘crafted’ air. The design has proven to be Brabantia’s most popular ever. All entries are displayed in the Gallery, where the general public can vote for their favourite designs. Are you ready to join the Brabantia design team and make history?